Minnesota Outcome Could Embolden Washington Republicans : It's All Politics Now that Minnesota Gov. Mark Dayton, a Democrat, has signed budget legislation ending the government shutdown in that state, could the outcome there have an impact on the debt-ceiling fight in Washington? A Washington reporter with Minnesota ties thinks it may embolden congressional Republicans. Minnesota Gov. 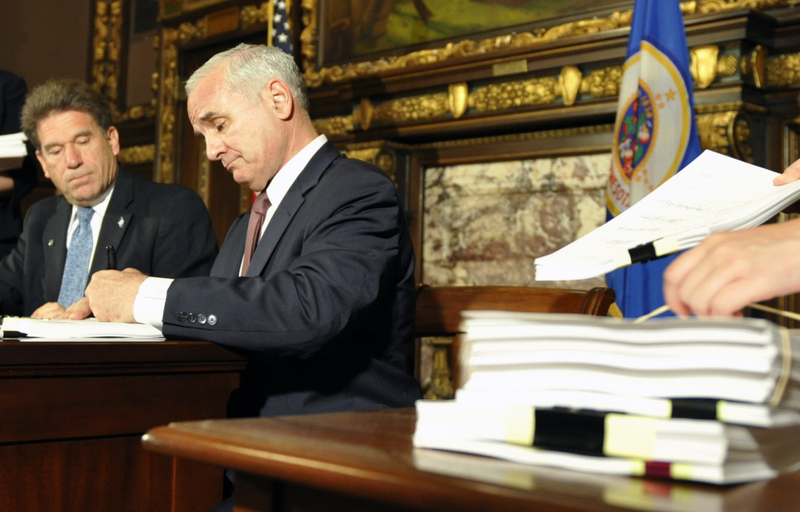 Mark Dayton signs the state budget bill to end his government's shutdown as Secretary of State Mark Ritchie watches, Wednesday, July 20, 2011. Now that Minnesota Gov. Mark Dayton, a Democrat, on Wednesday signed budget legislation ending the government shutdown in that state, could the outcome there have an impact on the debt-ceiling fight in Washington? Minnesota Public Radio's Tom Crann interviewed Al Eisele of The Hill and got his thoughts on that issue. Eisele was a long-time Washington reporter for Minnesota newspapers earlier in his career. EISELE: In many ways, what appears to have happened in Minnesota with Governor Dayton, it looks as though he has agreed to Republican demands, I think that's encouraged Republicans in Congress and encouraged them to hang tough against Obama. And they see Dayton as caving in to the Republicans, especially on the issue of not raising taxes. So I think that that is the way that it's viewed by many in Congress. Republican policymakers in other states have hung tough and forced their agenda through as well. Think governors Scott Walker in Wisconsin, Chris Christie in New Jersey and John Kasich in Ohio. So there exist several significant examples for congressional Republicans to look to though the Minnesota example may be most apt since it involved GOP legislators taking on a Democratic chief executive.